A metaphor for life, but specifically, the writing life. "It's a marathon, not a race," my agent, Edward Necarsulmer has told me about my career. "Yeah, yeah, yeah," I've said, understanding the words intellectually, but not really getting it until now. I started the NaNoWriMo thang last week, hoping to get my mind off of EDGES' looming pub date, but it has only served to get me in "race" mode, and worrying about things I don't normally worry about. Like word count. I already write every day, but I can't be in, what my writer friend Deborah calls "the bubble" for long periods of time right now. I am still adjusting to my new life out here in Northern Westchester, developing new relationships and making new friends, building Writopia out here and of course I have my husband, 3 munchkins, and a kitchen that is finally being put in. But all of us have our distractions. I watched Ginger and Greg not only run the marathon, but train for it, negotiating time for and with each other. Both work full-time - Greg is an actor and Ginger is a psychotherapist, AND they also have three kids. In training, they built up they're endurance over time to run the 26 mile race-that's-not-a-race. Writing is a practice, a training of sorts, needing determination, perseverance, and negotiation. NaNoWriMo is an intense training period, but it doesn't just end there. "Once I got past the first five miles," Ginger told me "it got easier: it became about something else." That runner's high? (I'm past the first five miles with my writing career. After YEARS, my first novel is coming out in 27 days! I'm in the marathon-that's-not-a-race.) Greg got some leg cramps towards the end and thought he might not make it, but his coach jumped in and started running with him, egging him on. "You can do it!" He did it. I have had some leg cramps and will certainly have more, but I've got a team around me and running with me to keep me going through the growing pains. 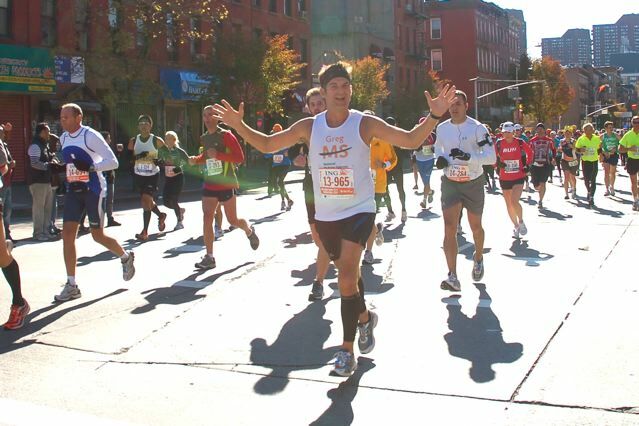 In a marathon, you're running with other people, working on your personal best. The goal for most people isn't to "win" - they win by trying and completing the 26 miles. In the writing life, I'm developing my own voice and my personal best with each book, with each story that begs to be told. Sure, it would be nice to "win", but I want all of the other writers who are in the marathon with me to win too. We're in it together, some of us running fast, others limping, but we're all in it. And books need to marinate in our heads and on the page - they take a long time to become real. Writing isn't a race. I used to be desperate to have a second contract already, but I still don't have one. That doesn't change my worth as a writer. It just makes me all the more determined to put my best work out there. And I'm failing spectacularly at this NaNoWriMo thing. Only 6000 words! (Look who is counting?) But that doesn't mean I call it a day and give up, oh no! I'm just taking the pressure off, with a new understanding that life is a marathon, and as long as I keep moving, I'm good. It's when I stop and feel paralyzed that there is a problem. I allow myself to get trampled. And if I feel kicked - I ask for help and support as soon as I can. After the NYC marathon on Sunday, we regrouped at Ginger and Greg's place for a debriefing and a pizza party. Amidst the chaos and soreness, G & G were glowing with exhilaration, pride, and relief. And most of all, this experience has woven itself into the fabric of their lives, love for each other, and has become part of who they are. Deliciously inspiring. So, to myself and other writers out there: just keep moving forward, and don't worry about speed! Celebrate the little accomplishments along the way, pat yourself and your friends on the back and lower your expectations of word count and publishing, and allow yourself to feel the luxurious sensuality of words, and why we love to write in the first place. Yay us! Glad we're running together Lucy! i'm limping along with my novel, lena, but really glad to be in touch with you. helps to hear about others' struggles - even if you are way out ahead, with that upcoming book! Thank you for sharing your thoughts. I really appreciate your efforts and I am waiting for your next write ups thank you once again. Outdoor marketing functions admirably to promote your item in particular geographic zones. While bulletins, transport seats, and travel advertising can be extremely compelling for the little entrepreneur, any fruitful open air crusade starts with your own particular area's signage. We can learn a lot of things from NYC Marathon and in this article you wrote some things which we should apply and make our life more enjoyable. I have seen a lot of people which not physically looking good but due to encouragement and dedication, they participate in Marathon. Any how, www.ukbesteessays.com also good for the students to learn a lot of things which help them in their Education. make sure that our nation’s maximum assets can recover their self-governing spirit. We can take in a great deal of things from NYC Marathon and in this article you thought of a few things which we should apply and make our life more agreeable. I have seen many people which not physically looking great but rather because of support and commitment, they take an interest in Marathon. In any case, UK Dissertation Help additionally useful for the understudies to take in a ton of things which help them in their Education. The article on NYC marathon journey with friends is amazing and motivate to move froward your friends are backside of you. Support of friends encourage you to do any thing in life. This article is nice.. in this article great deal of things from NYC marathon.. in this article you we should apply and make our more enjoyable, thanks..
Best assignment service for studnets who are feeling tired because of task work. The APA examine paper help Writing administrations of "StudentsAssignmentHelp" are supportable for the understudies.